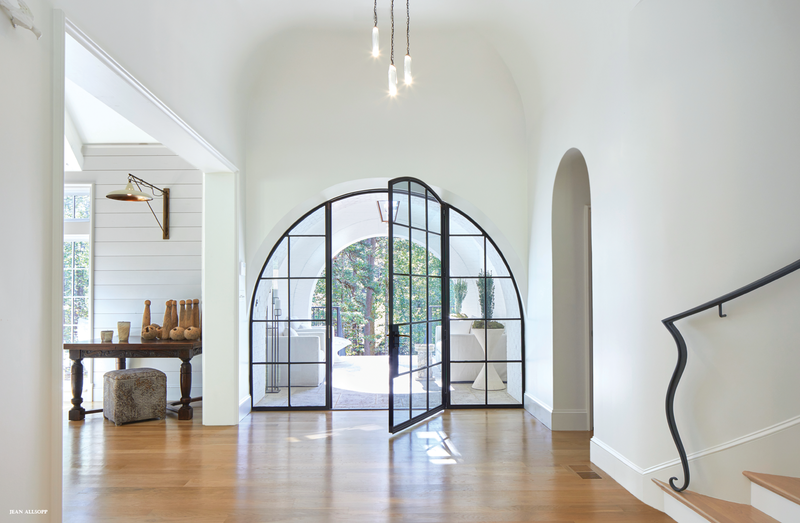 ABOVE The oversized arched steel front door gives a hint of the unexpected and exceptional details inside. While the Internet has opened up the formerly secretive world of design to anyone with a network connection, it has also spawned a sameness of sorts. Everyone seems to be pinning and posting similar looks so quickly that “good design” has become a bit predictable. So when you see a house that pokes a little hole in that—and makes you question the zeitgeist a bit—it’s like a blast of fresh air. 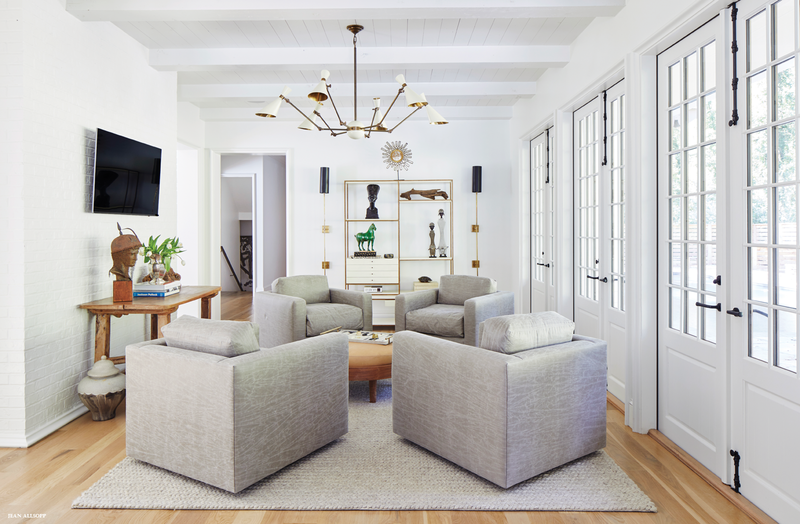 Laura Vogtle brings that blast, perhaps channeling decorating mavericks of the past, to help her clients make their new homes into something a bit extraordinary. Paint the dining room black, including the ceiling? Go for it! Put faux fur on the back of traditional dining chairs? Yes ma’am! 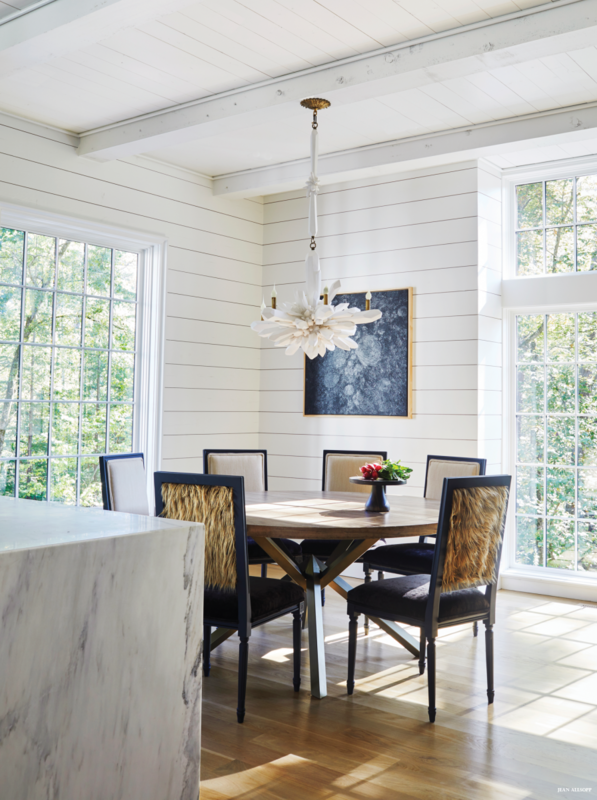 Add an almost ceiling-height tufted banquette in the kitchen’s dining space? Most definitely! “I like a little unpredictability in design, ” says Laura. “But nothing so over the top that it looks random or distracts from the whole.” For this particular home, she certainly showcased her unique style. ABOVE Unstained white oak floors flow throughout the home. “Originally, my client wanted a dark color, but when they put the floors in, the wood was so beautiful that we decided to keep it natural, ” says Laura. Calm colors in the living room set off the more dramatic features like the light fixtures, art, and antiqued mirror. On the flip side of all that space and style is a serious dedication to comfort, as well as close attention to how the family lives. A television room sporting smart swivel chairs opens up to the pool area for ease in entertaining. There’s a wonderful office strategically placed to allow views clear through from the front to the back of the house. The kitchen offers plenty of space for large meals with barstools, a table, and the aforementioned banquette. Attic space was finished out to include a chic “bunkhouse” with five single beds for sleepovers. Even with all of this unique style, the real showpieces throughout every room are the perfectly proportioned and amazing light fixtures that look more like art. That should come as no surprise to those familiar with Laura’s resume—art galleries, Gallery 1930, Scene, and Design Supply at Pepper Place, her most recent undertaking. She truly has that much-lauded “eye” that can’t be picked up at Parsons or SCAD. “Laura is very intuitive about what works in a room, especially when it comes to scale, ” says the homeowner. As Laura explains, “I do believe in taking some risks here and there.” Spoken like a true decorating maverick. After all, no risks, no rewards. ABOVE Swivel chairs in the den work for television or conversation. The French doors along the back open up to the pool area. ABOVE LEFT The wood-paneled walls lend a casual note to the kitchen dining area while the faux fur-backed chairs and eye-catching chandelier up the sophistication factor. 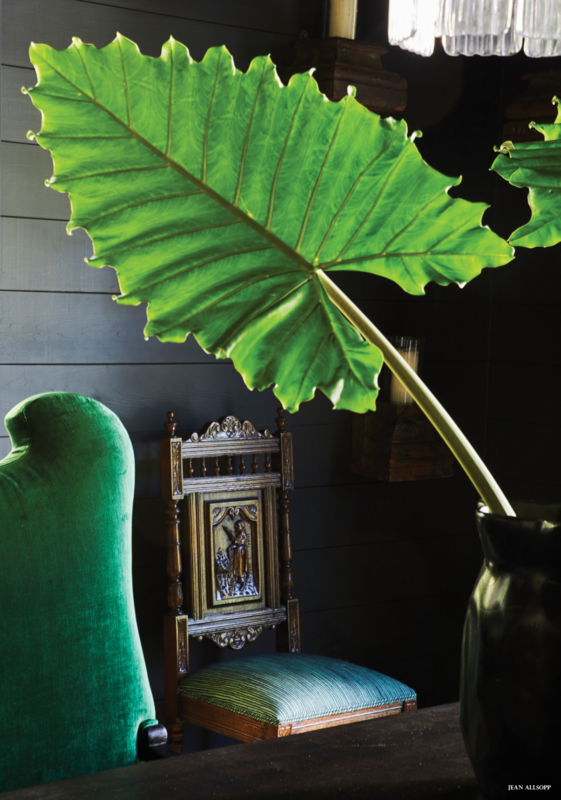 Paint a room a deep color and extend that color to the ceiling for a moody or romantic look—works great in dining rooms, powder baths, and libraries. 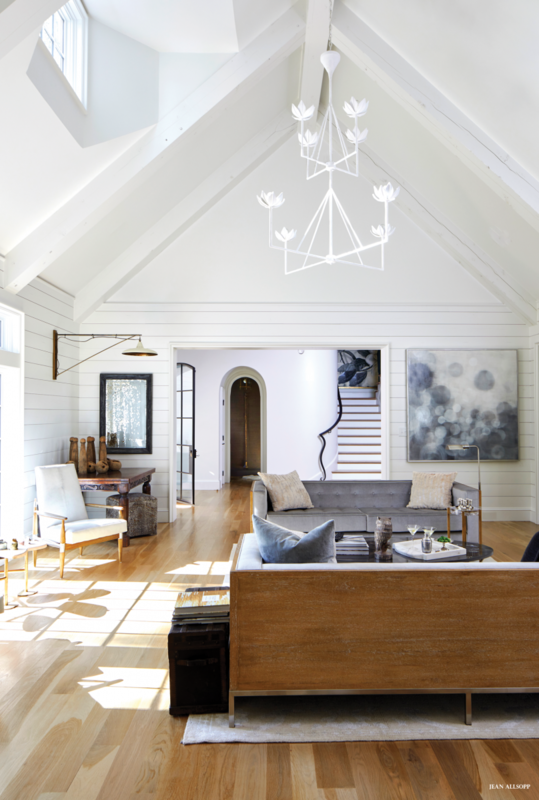 Think outside the standard go-to resources for light fixtures and choose ones that will bring a layer of excitement to a room—almost like a great piece of jewelry. Vary the finishes in a room—include wood with patina to temper slicker surfaces, and layer in throws and pillows for softness. Mix antiques with contemporary pieces. Be selective about what decorative accents to include—choose things that are authentic and personal, and let those pieces stand out. A little can go a long way. Art can transform a room. Buy what you love, but consider the scale. You may need to have something commissioned to work in a particular space. Seek out a gallery or specialist for assistance. ABOVE AND BELOW The spacious master bedroom needed a sizable light fixture, and Laura found the perfect one in her hunt for unique accents for the home. 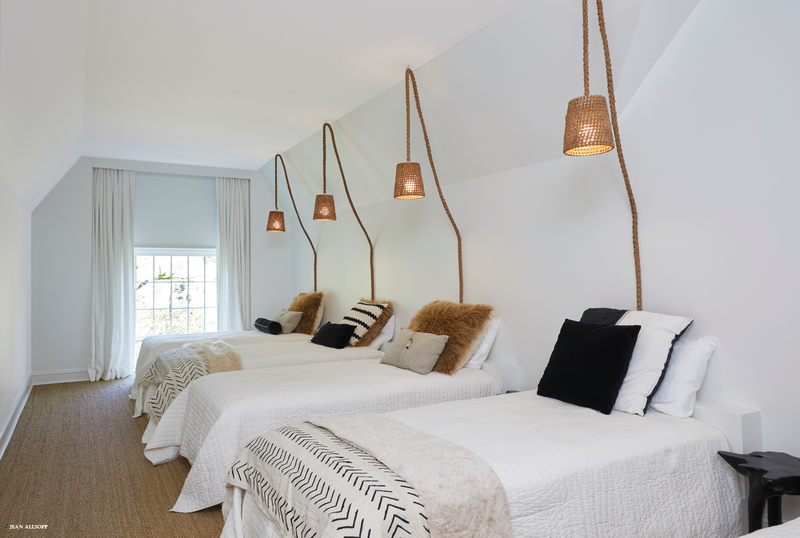 Simple sheers line the room, cocooning and softening the space. ABOVE The glass-paneled shower wall in the master bath relates back to the door at the front entrance, giving a design point of reference in the home. ABOVE AND BELOW “I love that Laura really questioned my daughters about how they wanted their bedrooms to look. 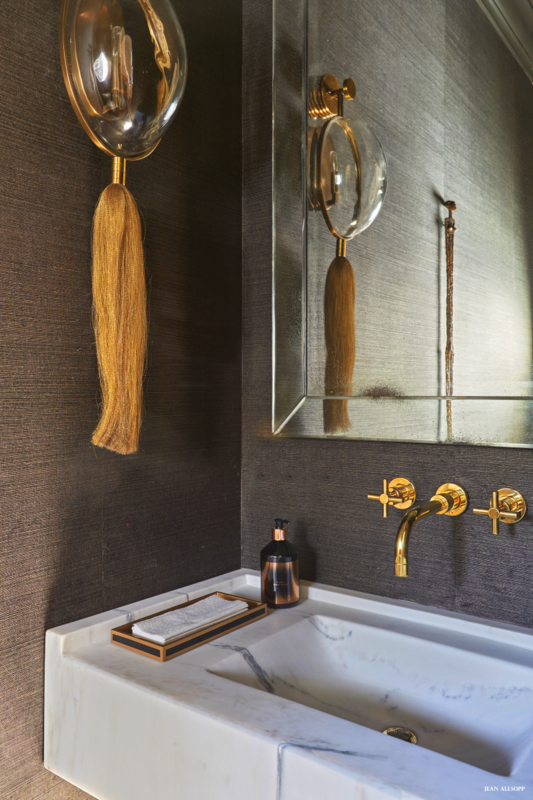 One loved the golds, and other wanted a silvery look, ” says the homeowner. Each daughter has her own private bath and den. ABOVE A bunk room accommodates sleepovers. 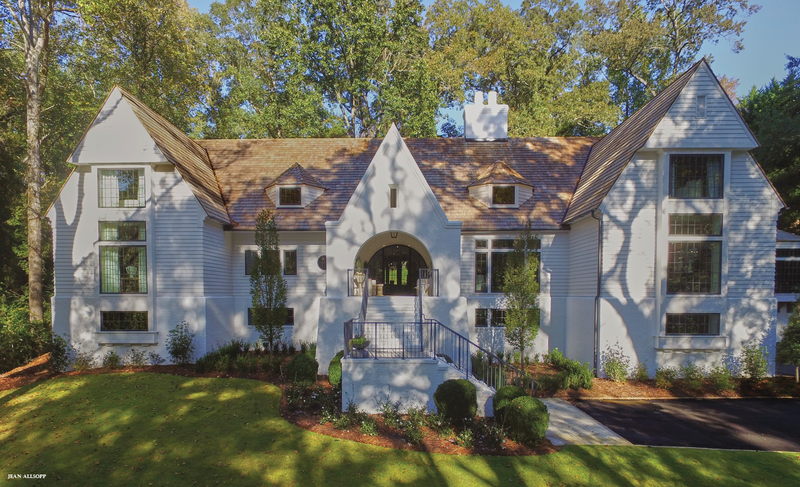 Interior designer: Laura Vogtle, Design Supply • 205.910.5369 laura@designsupplyshop.com Builder: Trey Goldstein, Cotton Construction Inc. • 205.413.1962 cottonconstructioninc.com Landscape design: Curb Appeal • 205.942.5200 curbappealonline.com Banquette in kitchen: Grant Trick of Design Industry • 205.224.5599 granttrick.com Vanity in powder bath: Brooks Barrow through Design Supply at Pepper Place select art available through Gallery 1930 • 205.870.1930 artgallery1930.com Foyer: ceiling light fixture: Ochre ochre.net Living room chandelier: Julie Neill through Design Supply Dining room: chandeliers: through Design Supply table: Taracea through Design Supply Family room: Verellen chairs: Patina • 205.802.9805 chandelier: Julian Chichester through Design Supply Master bedroom: bed: Oly Studio through Design Supply Chandelier: Arete Collection Aretecollection.com Master bathroom chandelier: through Design Supply Girl’s Gold Bedroom: bed: Made Goods through Design Supply Girl’s silver bedroom chandelier: through Design Supply.